There's a big difference between an adequate piece of furniture and one that is the perfect fit. When you have custom taste, let Morelli Upholstery custom-build the furnishings that fit your life. Crafted with durable frames, these custom-built pieces will last a long time and can be enjoyed for years and generations. Maximize your precious space. Live and work in satisfying comfort. We custom build furniture that fits the nooks and crannies of your living room and space. 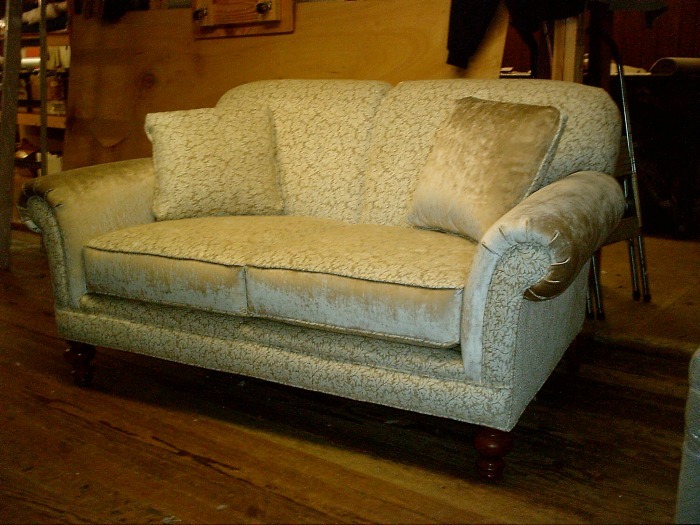 Morelli Upholstery modifies and adds options to chair arms and backs, and can customize skirts on couches. Got a detail you want to give the spacial touch? Talk to us and we'll work with you for the best creative solutions. Our team will professionally assemble furniture kits from the world's most stylish and reputable dealers like Chervan, builders of the world's finest furniture frames since 1932. You'll find plenty of styles and the quality you deserve in our catalogs of custom furniture kits. Come in and take a look. The two photos below show you how we begin with a kit and customize it with your choice of fabric. Click images to enlarge. or email raymorelli@comcast.net. Serving greater Youngstown, Warren and other communities in Columbiana, Mahoning and Trumbull counties and western Pennsylvania.